When it comes to your hazmat storage building, there are a number of things to consider. Hazardous materials are dangerous for the environment, as well as for you, the person handling them. Your hazmat storage building should be designed to enhance safety within your facility, to contain and control hazmat spills or leaks, and to protect your personnel. A proper hazmat storage building should be able to withstand chemical hazards such as fire, explosions or blasts, and chemical reactivity, while increasing efficiency within your hazmat storage. Efficiency and convenience within your hazmat storage building can do wonders to prevent accidents such as spills or leaks from occurring. However, the area should be restricted to prevent unwanted access to hazardous materials. A hazmat storage building from U.S. Chemical Storage can grant you all these securities, and more. OSHA has different requirements for hazmat storage, depending on what hazardous material is being stored. Flammable and combustible hazardous materials should be stored in fire rated buildings, and unstable materials require explosion relief construction. A hazmat storage building should be designed according to the hazardous materials it stores. Depending on the boiling point and melting point of each chemical, reactivity, flammability, and explosion hazard data, each substance requires a different environment for storage. It is important to adhere to these storage requirements in order to prevent potentially lethal incidents from occurring. Health hazards are another important thing to consider. Some hazardous materials are corrosive or produce toxic fumes. The design of your hazmat storage building should take these hazards into consideration, to protect personnel and visitors who handle or process your hazmat storage. If your hazardous material requires ventilation to prevent the buildup of toxic fumes, then your hazmat storage building should be furnished with the proper equipment. It is important to segregate flammable materials from nonflammable in order to minimize damage in the event of a fire, and flammable hazmat storage should be well-marked with visual warning signs to alert personnel of potential fire hazards. If you’re storing flammable materials, U.S. Chemical Storage has a hazmat storage building to suit your needs. You can furnish your custom hazmat storage building with fire suppression systems, as well as visual and audible alarms to alert your personnel to the chemical fire. 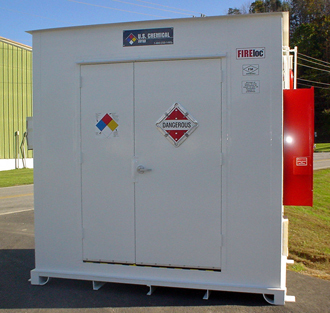 Our flammable storage buildings are fire rated for 2 or 4 hours, depending on your hazmat storage building requirements. We will custom build your hazmat storage building according to your desires, helping you remain compliant while maintaining a safe environment within your facility.